Now reading: Can Yoga Really Increase Energy? You were probably aware of most of yoga’s benefits already--it’s great for flexibility, balance, and relaxation, to name a few. But did you know that it’s also super effective for increasing energy? Here at SUTRA, we like to make sure our claims can be backed up, and in this case it wasn’t hard to find some scientific articles to prove our point! One scientific study published in 2017 by the University of London’s psych department found that performing yoga poses (particularly back bends) increases energy and sense of competence in working towards goals! It also improves self-image. Another study found that practicing yoga was effective for reducing persistent fatigue. The question is, how does yoga increase energy? We’ve talked about cortisol before, usually in the context of trying to reduce it. It is the stress hormone, after all! Obviously we don’t want too much of it in our system, but as it turns out, too-low cortisol levels can be pretty destructive, too. When we don’t have enough it can lead to lots of unpleasant symptoms like fatigue, gastrointestinal effects, low blood pressure, and even reproductive issues. Luckily, a consistent yoga practice will help balance out this hormone once and for all--if it’s too low it will help to raise it, and if it’s too high it will help to lower it. Side note, though, we recommend a visit to your doc if you think your hormone balance might be off! Yoga is great for keeping stress and anxiety at bay. It helps to alleviate tension in areas where we tend to hold our stress, such as our necks and lower backs. It also makes us more aware of our breath and encourages deep breathing, which are great for mindfulness and relaxation. When we slow and deepen our breathing, it is soothing to the immune system. Deep breathing is helpful on and off the mat--it’s something we can practice anywhere, in any situation, and yoga will help us naturally build this habit. That same deep breathing means our blood is constantly receiving fresh oxygen. It stimulates blood flow and circulation, which increases energy and has benefits in store for the whole body. Some of the harmful effects of sitting too long can be counteracted by a consistent yoga practice. Back bends that stretch the spine are particularly beneficial in this area. That’s why most of the poses listed below are back bends! Are you sleeping a lot but still feeling tired the next day? The number of hours you’re getting might not be the issue--the problem might be the quality of sleep you’re getting. Enter yoga! It has been shown to improve sleep quality, which will leave you feeling less fatigued right off the bat when you wake up. There are certain yoga poses that are known to be particularly effective for deeper, higher-quality sleep. Try the ones in this Huff Post article tonight before you hit the hay. You’ll notice that most of these are back bends. Studies have shown that these are the best yoga poses for increasing energy, since they open up the front of the body and stretch through the spine. Click each one for in-depth instructions! This one stretches through your upper back, neck, shoulders, and chest and it is great for reducing fatigue and bumping up energy levels. Camel pose is great for reducing both fatigue and anxiety. It’s also useful for mild back aches and easing menstrual pain. Known for offering a cleansing and rejuvenating stretch, downward dog offers tons of benefits. It provides relief for stress and mild depression as it energizes and strengthens the body. Down dog can also be therapeutic for high blood pressure and asthma. Upward dog is a great chest opener (which, remember, means hella energy! ), and much more. Anyone looking to improve their posture, strengthen their back and arms, or find relief for depression, fatigue, or sciatica should incorporate this pose into their practice! Not only does bow pose energize and de-stress the body, it provides relief from constipation and mild backache. It’s also helpful in relieving respiratory ailments. Yoga Journal cautions that anyone with spine injuries should consult an experienced teacher. Everyone else, enjoy! Half Lord of the Fishes pose relieves menstrual pain, fatigue, sciatica, and backache. It also energizes the spine provides a great stretch for places where people commonly hold tension: the shoulders, hips, and neck. Not only is this pose incredibly energizing, it is also said to decrease depression. It stretches out the chest and lungs while strengthening the arms and wrists, legs, buttocks, abdomen, and spine. Wheel pose can even help out your thyroid! Bridge pose can be helpful in lots of ways—it energizes, rejuvenates, and restores. It alleviates stress and symptoms of depression (noticing a trend?) while improving digestion. Bridge pose reduces anxiety, fatigue, backache, headache, and insomnia and can be therapeutic for osteoporosis. If you’ve had a neck injury, we recommend skipping this one. Everyone else, go for it! Shoulder stands boast the double-whammy of reduced fatigue and alleviated insomnia. It also relieves stress and depression. As a bonus, it tones up your legs and booty too! This is another one to skip if you’ve sustained a serious lower-back or neck injury. For the rest of you, it’s great for quick energy and alleviation of fatigue, anxiety, mild backache, and constipation. If you do all of those poses, your back will probably be a little tired! Here are some spine-releasing poses to balance out your practice. We’ve talked about how yoga is a great source of increased energy…but how do we stretch its benefits even more? The first way is through the energizing magic of pre-yoga smoothies! This is a perfect way to incorporate even more superfoods into your diet that will help you reach your goals on and off the mat. Ayurveda – what you should know! Often called the “sister science” of yoga, Ayurveda is a system of taking care of the body that developed in the same region and at the same time as the tradition of yoga. The two are closely connected. In Ayurvedic medicine it is taught that we can optimize our bodies through food—whole food, not fad diets. In practice, this means eating lots of superfoods. We did a little research and put together the perfect pre-yoga smoothie recipe, full of energizing superfood goodness! Blend it all up and drink it down about an hour before you get on the mat for optimal pre-yoga energy! Yoga has lots of benefits besides increased energy—decreased inflammation, detox of the body, and a boosted metabolism are just a few. If you want to send those benefits through the roof with even more superfoods, look no further than SUTRA Gold. We talked about Ayurveda earlier. Well, you’ll be happy to know that SUTRA Gold contains two “golden” Ayurvedic superfoods: ginger and turmeric! Ginger is often called the “universal medicine” and touts benefits like encouraging healthy appetite, calms indigestion, and promotes healthy circulation. Turmeric does the same…but to an even greater extent! Making a habit of drinking a hot cup of SUTRA Gold each night will do wonders for your practice! If you notice your joints are inflamed, you feel nauseous, or your digestive tract is having troubles, those things can all affect your practice…or, at the very least, your motivation to get on the mat! 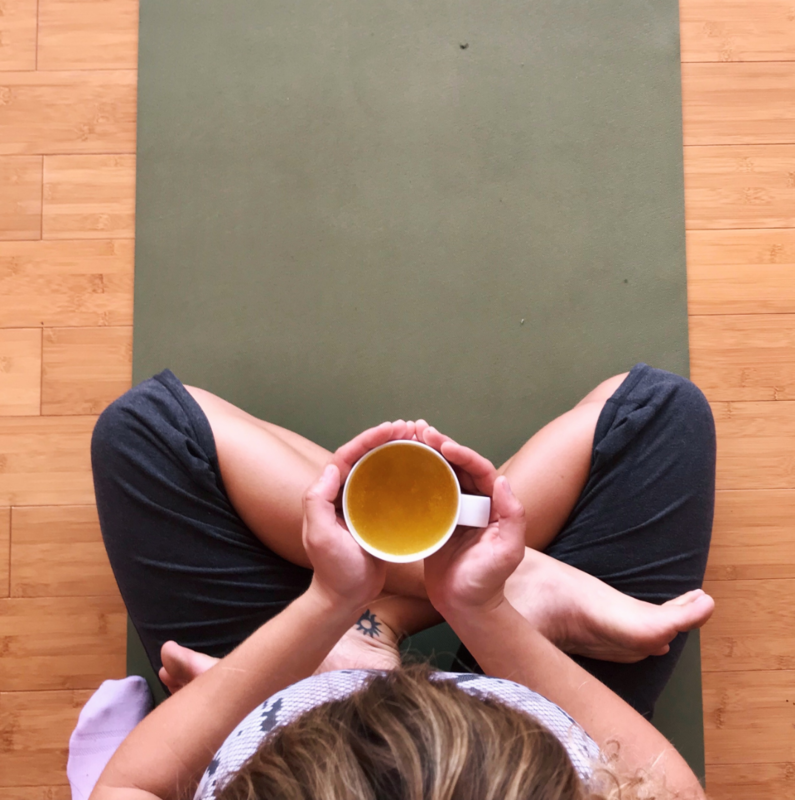 This hot drink will help to counteract all those not-so-pleasant symptoms, and its superfood ingredients will help energize you for a new yoga sesh the next day! If you don’t believe us, the proof is in the pudding…er, SUTRA.